Chicago is a great town to celebrate Christmas and New Years. Are you opening up your home to holiday visitors? We’re not just talking about a fun party but for an extended stay. Whether they are family or friends from out of town you want to make them feel welcomed as in, “home away from home” welcomed. To get that right, you’ll need to do a little prep work. First, find out what your guests enjoy to drink or snack on. Tastes change over the years and they might be “into” something totally different than the last time you saw them. You especially want to find out what they enjoy waking up to in the morning. Yes, snag some pastries from your favorite neighborhood bakery but also set up a coffee station for them. Get the pot, pods, mugs, sugar and creamer ready on a tray. That way they won’t have to wake you when the wake up. Comfort is also a consideration when it comes to the actual bed. Might be time to take a nap on that guestroom bed to see if it is a nice place to snooze. Be sure the linens have been freshly laundered and the pillows are fluffy. While you’re at it, double check the TV remote (if there is one) and replace the light bulbs. You don’t want them knocking about in the house. 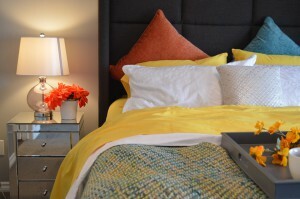 Clutter is another consideration for getting your guestroom ready for holiday guests. If that spare room has become your family’s storage locker, then it is time for some serious decluttering. Instead of moving unwanted stuff from one room to the other, why not give Junk King Chicago a call. These are the expert junk haulers who can make any pile of junk vanish right before your eyes. Junk King will provide the moving crew and truck. All you need to do is provide the junk and that is accomplished by literally pointing to the things you want removed. The team from Junk King will do the rest. Once that clutter is clear, you can add some finishing touches like fresh flowers or scented candle. Your guestroom will be ready for holiday visitors with a little help from Junk King Chicago. This entry was posted in Chicago Junk Removal and tagged holiday visitors, Junk King, junk removal on November 30, 2017 by Junk King. Last updated December 1, 2017 .